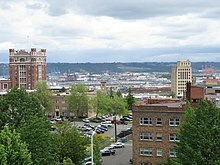 The Hilltop Neighborhood is a historically diverse neighborhood in the Tacoma, Washington Central District. 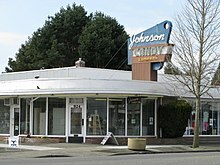 The National Register of Historic Places specifies the geographic area of Hilltop as located within the City of Tacoma and bounded on the east by Tacoma Avenue South, on the north by Division Street, on the west by Sprague Avenue, and on the south by the edge of the bluff, which roughly equates to South 27th Street. Hilltop derives its name from its location on a high bluff overlooking Commencement Bay and the Port of Tacoma. Hilltop is near the historic Tacoma Public Library main branch, Bates Technical College, the Pierce County Courthouse, and the new Pierce County Correctional Facility, all of which are located on Hilltop's east side. It is adjoined by Tacoma's more affluent Stadium District. Sound Transit plans to build a streetcar line on Martin Luther King Jr. Way, between Division Avenue and South 19th Street, by 2022, connecting to the existing Tacoma Link in Downtown Tacoma. The Hilltop was once notorious for drug-related gang activity, most notably related to the infamous Hilltop Crips. The word "Hilltop" became synonymous specifically with Tacoma's gang problems, and more generally with urban pathologies associated with the US's crack epidemic. The Hilltop gained a reputation for drugs and violence with the Mother's Day riots in the 1970s. In the early 1980s Tacoma Civic Leaders sought federal dollars by accepting a large number of Cuban Refugees. Circa 1984, an unknown Los Angeles Crip association began organizing local Hilltop youth to sell primarily powder and crack cocaine. A yearlong violent struggle ensued. Eventually, Cubans involved in the drug trade were murdered or left town. By September 23, 1989, the Hilltop Crips had become powerful, with violence and homicides at a peak, and police departments overwhelmed. The Hilltop made national news in 1989 when several US Army Rangers got into a shootout with gang members in what came to be known as the Ash Street Shootout. Hilltop is home to Tacoma's regional hospitals MultiCare Health System Tacoma General Hospital and Mary Bridge Children's Hospital along with CHI Franciscan Health St Joseph Medical Center. Kaiser Permanente Tacoma Medical Center is located adjacent to Tacoma General Hospital. In 2013 the $26 million Hilltop Regional Health Facility opened . The Hilltop's hospitals and medical centers are known as the 'Medical Mile'. Hilltop is served by 3 elementary schools; McCarver Elementary, Stanley Elementary & Bryant Montessori, all part of Tacoma Public Schools. 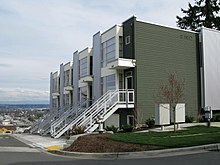 SOAR Academy, a public K-8 Charter School is also located on Tacoma's Hilltop. 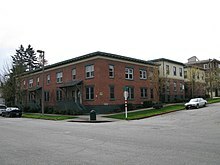 The Evergreen State College Tacoma campus is located in the Hilltop neighborhood. Bates Technical College's Downtown campus is located on the border of Hilltop and Downtown. The neighborhood's population is 12,002 and remains racially diverse. 41% of residents are White, 30% Black or African-American, 12% Asian, 3% Native American, 1% Pacific Islander, 3% from other races, and 8% from two or more races. Hispanic or Latino of any race were 7% of the population. 32% of residents were below poverty line. In 2007, the Tacoma City Council adopted new official boundaries for downtown Tacoma which included a portion of the Hilltop neighborhood as far west as South L Street and changed the name of the Hilltop business district to the Upper Tacoma Business District. In 2011, the City Council recognized that Upper Tacoma was an outdated name. The Hilltop Business Association (formerly the Upper Tacoma Business Association), led by President Eric Crittendon, reclaimed the name "Hilltop," purchased new stationery and installed Hilltop banners along Martin Luther King Jr. Way. ^ "Our City: Neighborhoods". City of Tacoma. Retrieved 2012-04-04. ^ "Tacoma Link Expansion". Sound Transit. Retrieved May 4, 2016. ^ "Tacoma Link to remain fare free until Hilltop extension opens" (Press release). Sound Transit. April 28, 2016. Retrieved May 4, 2016. ^ "The Seattle Times: Washington's Bruised Economy". The Seattle Times. ^ "Crime Activity Map". City of Tacoma. Retrieved 2017-10-13. ^ Merryman, Kathleen. (November 28, 2011). "Proud to live, play and shop on Tacoma's Hilltop." Tacoma News Tribune. Retrieved 6/12/12 from http://www.thenewstribune.com/2011/11/28/1923694/proud-to-live-play-and-shop-on.html.